This quiche is bursting with chunks of crispy canadian bacon and juicy bits of sweet pineapple. A fun, easy, and tropical take on a breakfast classic recipe! Preheat oven to 375 degrees. Prepare ingredients by dicing pineapple, and canadian bacon. Shred the cheese. Spray 9 inch quiche dish with cooking spray to prevent sticking. Spread the cheese, pineapple, and canadian bacon on the bottom of the quiche dish. Crack the eggs and add to a large liquid measuring cup, add the 1/2 cup cream and then add milk until the total volume is 2 cups. Mix quickly with a hand mixer or a whisk until light and frothy. Add the salt and pepper and continue to mix or whisk until frothy again. 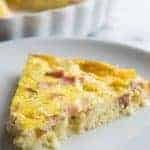 Pour the egg mixture into the quiche dish over the cheese, pineapple, and bacon. Bake for about 40-45 minutes or until the egg is cooked, no longer liquid looking in the center, and turning golden on the edges. Remove from the oven and allow to cool. Serve quiche room temperature.